Astilbe are perennial flowering plants that are also referred to as false spirea. The plants are shade-loving and will bloom for up to six weeks during the summer growing season. They produce upright plume-like flowers that resemble feathers. They come in pink, white, lavender, purple and red. Astilbe makes for excellent border specimens, and the flowers can be dried and used in floral arrangements. Fill up 4-inch pots, trays or a seeding flat with a good quality seeding mix. Firm the seeding mix down using a spoon. The mix should be firm enough that the seeding mix will hold together and not crumble apart when transplanting. Set the pots or tray into a basin, bucket or irrigation tray that contains about an inch of water. Once the pots or tray have absorbed the water and the seeding mix is visibly moist, remove them. Set the pots or tray aside and let drain before you continue. Sprinkle the astilbe seeds onto the surface of the seeding mix. If using a seeding tray, plant a small pinch of seeds (about three or four) 1 to 2 inches apart. Press the seeds firmly into the soil using the back of the spoon. Do not cover the seeds; they won’t germinate if they’re buried. Set the tray or pots into a warm location that will stay around 68 degrees Fahrenheit. Mist the surface of the seeding mix with water to keep it moist but avoid waterlogging it, which will rot the seeds. Germination typically takes between one and three months. Transplant the astilbe seedlings into 1 gallon pots when they are about 2 inches tall. Locate a partially shaded location for planting the astilbe seedlings. Weed the area using a garden hoe. Eliminate all weeds and their roots. Dig planting holes in the weeded area, keeping each of the holes about 12 inches apart. Each hole should be wide enough and deep enough to accommodate an astilbe seedling’s entire root system. Scoop out an astilbe seedling from the seeding tray using a spoon. If using 4-inch pots, lay the pot on its side. Gently hold the seedling at the base of its stem while you wiggle the pot free from the root system. Plant an astilbe seedling into one of the planting holes. Scoop soil into the holes, filling them full. Then water each astilbe seedling thoroughly. Water the astilbe regularly throughout the growing season. They should be kept evenly moist, especially during dry periods. You can plant astilbe from seed from February through June or from September through October. 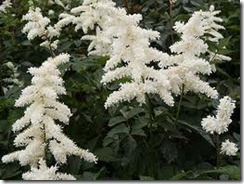 According to Ohio State University, astilbe are hardy in USDA zones 4 through 9. Cut back the previous year’s growth in early spring to encourage fresh growth and plentiful blossoms.